Talking Transportation: Will the Real ID Act Disrupt Travel? Something like 1.73 million Americans board airplanes ever day. And each of them must go through a very necessary screening by the TSA, the Transportation Security Agency. But beginning in late January 2018, a lot of passengers will be denied boarding because they don’t have the right kind of ID. You can thank (or blame) the Real ID Act passed by Congress in 2005 after 9/11 to make sure people really are who they claim to be. As any teen can tell you, it’s too easy to obtain a fake ID. And if teens can do it, terrorists can also. Because most people rely on their state driver’s license as ID, it’s been up to the states to gain compliance with the Federal rules. A lot of those states are not in compliance, but Connecticut has passed the test, sort of. If you’ve recently renewed your Connecticut license, you know you were given an option: get a “regular” license or a “verified” ID. To get a verified license you needed to bring extra proof to the DMV: a US passport, birth certificate, original Social Security card, etc. Look at your CT license and you’ll easily see the difference. If yours has a gold star in the upper right corner, you’re verified. No gold star, NOT verified … meaning that as of 2020 your license will NOT be enough ID to get you on an airplane. That license clearly says “Not for Federal Identification.” But for now, any CT driver’s license will get you past TSA. Sure, you can always use your US Passport as ID. It’s the gold standard and requires all kinds of identity proof to be issued. But if you don’t have a passport and don’t have a gold star on your CT driver’s license, starting in 2020 you’ll have to start thinking about taking Amtrak or driving. There are more than 8,000 Passport Offices in the US, most of them US Post Offices or libraries, which will process applications certain days each month. But the main Passport Office for our state is in Stamford. You can also file your application by mail, but only for renewals. First time applicants must appear in person with all their documentation. Mind you, US Passports are not cheap: $110 for first time applicants, plus $25 application fee. Renewals are also $110 and “expedited” passports are an extra $60. So the bad news is: if you don’t have a passport already, may need one eventually. The good news is, December is a great time to apply as it’s the Passport Office’s “slow season”, compared to the summer travel rush. Happy traveling! Editor’s Note: This is the opinion of Jim Cameron. About the author: Former NBC News director and anchor, now a professional communications consultant, Jim Cameron, pictured left, leads workshops on media training, speech and presentations skills and preps clients for analyst briefings and legislative testimony. 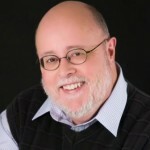 Jim served for 19 years on the CT Metro-North Rail Commuter Council, is an elected member of the Darien Representative Town Meeting (RTM) and is Program Director of Darien TV79, his town’s government TV station. Talking Transportation: Who Should Pay for Sound Barriers? Sound barriers … great idea, but who should pay for them? Building and maintaining our highways is expensive. But here’s a quiz question: on interstates 95 and 84, what costs a half-million dollars a mile to construct? The answer: sound barriers. Why are we spending that kind of money to enshroud our interstates simply to protect the peace and quiet of its neighbors? Didn’t they know that living that close to a highway came with the twin costs of increased noise and air pollution along with the benefits of proximity to the highways? Do you have sympathy for people who live near airports and then complain about the jets? Neither do I. But the solution to highway noise is not to create a walled canyon paid for by others. Sound barriers, in my view, are a waste of precious resources. They don’t reduce accidents, improve safety or do anything about congestion. And they’re a magnet for graffiti artists. Three miles of sound barriers on both sides of an interstate would buy another M8 railcar for Metro-North, taking 100 passengers out of their cars. 1) Why not sound-proof the homes? That has worked well for neighbors of big airports and would be a lot cheaper than miles of sound barriers. Plus, insulation against sound also insulates against energy loss, saving money. 2) Rubberized asphalt. Let’s reduce the highway noise at its source, literally where the “rubber meets the road”. Using the latest in rubberized asphalt some highways have seen a 12 decibel reduction in noise. And rubberized asphalt, as its name implies, is made from old tires … about 12 million a year that would otherwise be junked. 3) Pay for it yourself. Create special taxing zones in noisy neighborhoods and let those home owners pay for their sound barriers. They’re the ones who are benefiting, so shouldn’t they be the ones who pay? And that investment will easily be recouped in increased property values. 4) Penalize the noise makers. Let’s crack down on truckers who “Jake brake,” downshifting noisily to slow their speed instead of using their real brakes. And motorcyclists or those cars with busted mufflers, they too should be penalized. 5) Go electric. Electric cars are virtually silent. And there are electronic ways of using noise cancellation technology that, on a large scale, can induce quiet at a lower price than building wooden barricades. 6) Go absorbent. Where there is room, erect earthen berms alongside the highway which will absorb the sound. Or if you are constructing sound barriers, fill them with sound absorbing material, treating the noise like a sponge, not bouncing it off a hard, flat reflective surface. Our interstates, especially I-95, are carrying far more traffic than they were ever planned to handle. And there is no sign of it decreasing. In Fairfield County the rush hour starts about 6 a.m. and runs continuously until 8 p.m. without a break. If our state’s economy depends on these highways, we will have to live with the karmic cost of a little noise. But if it’s too much to take, why ask others to pay for its remediation when they are the only ones benefiting from that spending? Talking Transportation: All Tickets Please! Imagine you’re in a store and you see somebody shoplifting. You’re embarrassed to say anything or to make a scene, but inside you’re pissed-off. You pay for your merchandise, so why should that guy get it for free? And if he’s ripping off the store, doesn’t the merchant actually make you pay more to make up for that loss? It’s morally wrong and it’s just not fair. Yet this is what happens every single day on Metro-North when conductors don’t collect all riders’ tickets. Here’s a typical scene: your train leaves Grand Central and the conductor makes his way through the train collecting tickets. Sometimes he leaves a colored seat check, punched to show your destination, but not always. Why? Your train makes some intermediate stop (New Rochelle, Greenwich or Stamford) to discharge some passengers and take on new ones. You know who the new riders are, but does the conductor? So when the conductor comes through again saying “All Stamford tickets, please” and you see that new rider not responding, you know the railroad got ripped off and that cheater just got a free ride. Now, if the conductor had issued a seat check he’d know who got off, who got on and who owes him a new ticket. Simple enough, but not for Metro-North which for years has not enforced their use. Conductors who are too busy or too lazy, don’t use seat checks and we all end up paying more. Metro-North acknowledges this problem and admits it loses millions of dollars a year to uncollected tickets. But they’ve crunched the numbers and say that staffing trains with more conductors to be sure all tickets are collected would cost even more. Hey! Here’s a concept: make the existing conductors do their jobs instead of hiding out in their little compartments. From Grand Central to Stamford you’ve got 45 minutes without stops to collect everyone’s ticket, give ‘em a seat check, say “thank you” and still have time for a cat-nap. And there’s still time to ask people to keep their feet off the seats and to stop yapping in the designated Quiet Cars. Back in the good ol’ days before the TVM’s (Ticket Vending Machines) came along, conductors collected cash fares to the tune of $50 million a year. They had a money room at Grand Central that looked like a casino. Now most fares are bought from the machines or on your smart-phone. That means conductors should have a lot more time to make sure all tickets are collected. Conductors on Metro-North make good money. And they do a very important job keeping passengers safe, operating the doors, answering questions. They’re the face of the railroad and most passengers give them high marks. So what can you do if you see someone getting a free ride due to uncollected tickets? Try this, which always work for me. When I see a conductor miss a passenger’s ticket, I’ll wait until the conductor comes back and say something like “Excuse me, conductor. I think you missed collecting that gentleman’s ticket,” and then smile innocently at the conductor and the chagrined would-be thief. If I see the same conductor always missing ticket collections, day after day, I report it on the Metro-North website complaints page, detailing the incident by name, date, train number, etc. That allows the railroad to “re-train” the offending staffer. So if you’re tired of all these fare increases, let’s stop the shoplifters. Make sure everybody pays for their ride by having conductors collect all tickets. Sure, it was sleazy of Governor Malloy and the CDOT to release news of a proposed five percent fare hike on Metro-North on a Friday afternoon in July, hoping nobody would notice. But the more I dig into the proposal, the more I realize the Governor and CDOT are not to blame. It’s the Connecticut legislature that’s really responsible for this fare hike. Lawmakers this session left the Governor with a $192 million budget shortfall and every other branch of government has taken budget cuts and layoffs as a result. Now it’s transportation’s turn to feel the pinch. Pol’s on both sides of the aisle tell me Malloy could have saved millions by facing down the state employees’ unions and their rich benefits package. Could’ve, maybe should’ve … but didn’t. So now we’re looking at a five percent hike in train fares on Metro-North and Shore Line East and a 16 percent boost in bus fares starting in December. Plus closing ticket windows, reduced maintenance and fuel savings. And that’s just on the transit side. Highway work will also be cut, hiring postponed and less salt purchased for the winter. Service areas will be closed overnight and the volunteers who work in the Visitor Centers will be fired. Welcome to Connecticut! So when you calculate the impact of all these cuts on your commute, by road or rail, call your State Rep and Senator and ask “why”? Why are they allowing the Special Transportation Fund to run dry due to the dwindling revenues from the gas tax? Ask Senate Majority leader Bob Duff (D-Norwalk) and the usually pro-transportation Senator Toni Boucher (R-Wilton) why they have opposed alternative funding mechanisms like the VMT (Vehicle Miles Tax), calling it “dead on arrival” before it was even explained, let alone studied. Ask your elected officials what their plan is to pay for our existing transportation network, let alone expand it by the $100 billion Malloy has suggested. They won’t have an answer. Why? Because they are running for re-election this November. And none of them has the guts to tell you the truth: we will all have to pay more to drive or commute by rail … as you’ll find out after the election when they approve new taxes. What can we do in the meantime (aside from holding them accountable during the campaign)? There have been some public hearings in September on the fare hikes with more to come* … and we should all turn out. It will be political theater, but cathartic. Commuters will rant and the folks from CDOT will listen and then do what they proposed. Aside from cutting train service, a fare hike is about the only option. And, of course as upstate lawmakers constantly remind us, those of us living on the “gold coast” are all millionaires, and we can afford it, right? *9 Town Transit will hold a public hearing on its proposed price increases Thursday, Sept. 29, in Old Saybrook Town Hall at 4 p.m. and 7 p.m. Either of these Valley Railroad diesel locomotives pictured above, “0900” or “0901”, is used to power the Essex Clipper Dinner Train. 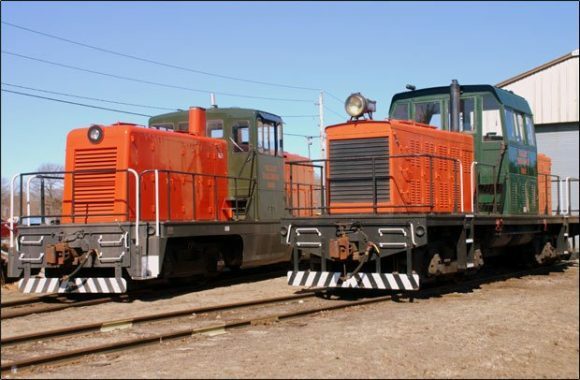 If you’re looking for family fun this summer, consider visiting one of Connecticut’s many living museums celebrating our rail heritage. The Shore Line Trolley Museum in East Haven (www.shorelinetrolley.com) was founded in 1945 and now boasts more than 100 trolley cars in its collection. It still runs excursion trolleys for a short run on tracks once used by The Connecticut Company for its “F Line” from New Haven to Branford. You can walk through the car barns and watch volunteers painstakingly restoring the old cars. There’s also a small museum exhibit and gift shop. The Connecticut Trolley Museum in East Windsor (www.ceraonline.org) began in 1940, making it the oldest trolley museum in the US. It too was started on an existing right-of-way, the Rockville branch of the Hartford & Springfield Street Railway Company. You can ride a couple of different trolleys a few miles into the woods and back, perhaps disembarking to tour their collection of streetcars, elevated and inter-urbans in the museum’s sheds and barns. If you’re looking for a day-trip, especially for kids, I can highly recommend either museum. But if you’re looking for trains, you’re also in luck. The Danbury Railroad Museum (www.danbury.org/drm) is walking distance from the Metro-North station, making this a potentially full-day, all-rail adventure. On weekends they offer train rides and for a premium you can even ride in the caboose or the engine. They have a great collection of old rail cars and a well stocked gift shop. For nostalgia fans, The Essex Steam Train (www.essexsteamtrain.com) offers not only daily rides on a classic steam train, but connecting riverboat rides up to the vicinity of Gillette Castle and back. In addition to coach seating you can ride on an open-air car or in a plush First Class Coach. There’s also a great dinner train, “The Essex Clipper” which offers a two and a half hour, four-course meal and a cash bar. In downtown South Norwalk, you can visit what once was a busy switch tower, now the SoNo Switch Tower Museum (www.westctnrhs.org/towerinfo.htm). Admission is free (donations welcome) weekends 12 noon to 5 p.m.
Also open only on weekends is the Connecticut Eastern Railroad Museum in Willimantic (www.cteastrrmuseum.org). In addition to guided tours, visitors can operate a replica 1850’s-style pump car along a section of rail that once was part of the New Haven Railroad’s “Air Line”. The Railroad Museum of New England in Thomaston (www.rmne.org) offers rail trips on Sundays and Tuesdays along the scenic Naugatuck River in addition to a large collection of restored engines and passenger cars including a last of its kind 1929 New Haven RR first class “smoker” complete with leather bucket seats. All of these museums are run by volunteers who will appreciate your patronage and support. They love working on the railroad and will tell you why if you express even the slightest interest in their passion. Try ‘em. About the author: Jim Cameron has been a Darien resident for 25 years. He is the founder of the Commuter Action Group and also serves on the Darien RTM. The opinions expressed in this column are only his own. Jim Cameron names Portland, Ore., (with Mount Rainier providing a stunning backdrop) the most mass-transit intensive city in the US. What’s the most mass-transit intensive city in the US? By the numbers, New York City. 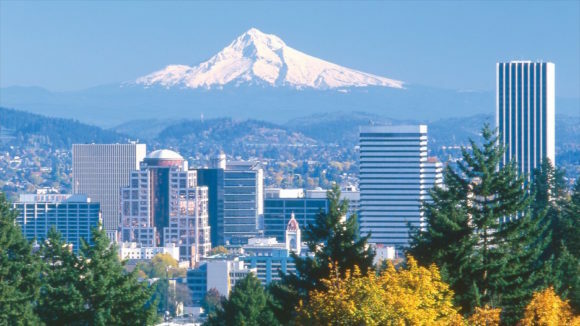 But for a glimpse of the real future of mass-transit, the winner is clearly Portland, Oregon. About the author: Jim Cameron has been a Darien resident for 25 years. 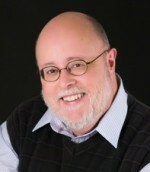 He is the founder of the Commuter Action Group and also serves on the Darien RTM. The opinions expressed in this column are only his own. Recently, NYC Mayor DeBlasio announced a $325 million plan to reintroduce ferry boat service to the five boroughs charging the same fare as subways. The mayor says these boats could carry 4.5 million passengers a year. SPEED: In open water, fast ferries on the Sound could make 30 knots (35 mph). But if they must sail up inlets to the downtown areas of Bridgeport, Norwalk or Stamford, that speed is cut to 5 knots, extending travel time. DOCKING: To keep to their competitive speeds, docks would have to be located close to the Sound. That’s expensive real estate. And what about parking at those docks… and drive-time on local roads to reach them? Again, more travel time. FREQUENCY: Metro-North offers trains to midtown New York every 20 minutes in rush hour carrying 800 – 1000 passengers per train. No ferry service anywhere in the country can compete with that frequency of service. Will travelers really be willing to wait an hour or two for the next boat? COMFORT: In nice weather, a boat ride to work sounds idyllic. But what about in a Nor’easter? The bumpiest ride on the train pales by comparison. FARES: The most optimistic of would-be ferry operators in CT estimate their fares will be at least double those charged on the train. And people say Metro-North is too expensive? OPERATING COSTS: Fast ferries are gas guzzlers, the aquatic equivalent to the Concorde. 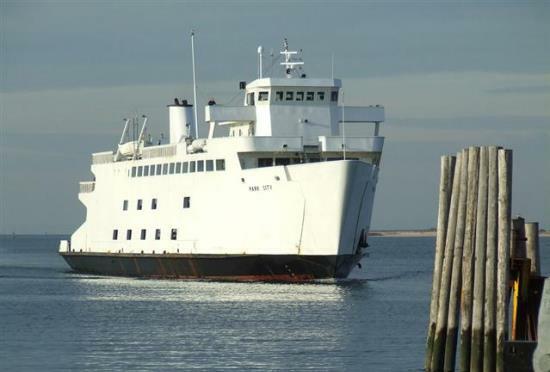 When the Pequot tribe built high-speed catamarans to ferry gamblers to their casino in Connecticut to lose money, the service proved so expensive to run that the Pequots dry-docked the ferries in New London. ECONOMICS: The final reason I don’t think ferries make economic sense is that nobody else does either! Ferry operators (like the near-bankrupt NY Waterways) aren’t stupid. They’ve looked at possible service from coastal Connecticut, crunched the numbers and backed off. In a free market economy, if a buck could be made running ferries, they’d be operating by now. They aren’t operating, and there are lots of reasons why, many of which I’ve listed. The only place ferries are run successfully is where they’re heavily subsidized (everywhere), have a monopoly (for example, getting to downtown Seattle from an island suburb), don’t duplicate existing transportation routes (like from Bridgeport to Port Jefferson), or offer advantages of speed because they operate on extremely short runs (from Hoboken to midtown). Our situation here in Connecticut passes none of those tests. You already know I’m a train nut. (The bumper sticker on my car reads “I’d Rather Be on the Train.”) And I do love an occasional recreational sail on the Sound. But it’s unrealistic to think that commutation by ferries is in our future. You may feel that your car is your last private refuge in this busy world. But there’s someone along for the ride: Big Brother. And you’d be surprised what he knows about you, thanks to modern technology. Your cell phone is constantly transmitting its location, and services like Google Dashboard’s location history can show exactly where you were at any date in time. Don’t want to be tracked? Turn off your cellphone. Even when you are nowhere near a toll booth, E-ZPass detectors can monitor your location. Want to stay anonymous? Keep your E-ZPass wrapped in aluminum foil in your glove box. The extensive network of traffic cameras on our interstates and parkways is used mostly to monitor accidents. But State Police can also watch individual vehicles. The cameras are even available to the public online. But state law specifically forbids using these cameras to write speeding tickets. This is the newest and most powerful tracking tech, as I saw in a ride-along a few years ago with my local PD. These cameras mounted on police cars can scan up to 1,800 license plates a minute as cars drive by at speed. While this may lead to very efficient law enforcement, LPRs also have a potentially darker side: the data about plate number, location and time can be stored forever. Faced with a string of unsolved burglaries, Darien police used their LPR to track every car entering the targeted neighborhood and looked for patterns of out-of-town cars driving through at the time of the burglaries and made an arrest. But the American Civil Liberties Union (ACLU) is concerned about how long cops can store this data and how it should be used. They laud the Connecticut State Police policy of only storing data for 90 days. In the early days of LPRs in 2012, an ACLU staffer filed an FOI request for his car’s plate number and found it had been tracked four times by 10 police departments in a database that had 3 million scan records. So enjoy your car. But realize that none of us have any privacy. 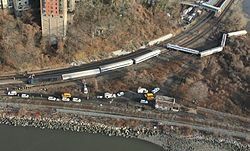 The Spuyten Duyvil derailment in 2013 caused massive disruption on Metro North..
June 1983: Inadequate inspections and repairs cause the collapse of the Mianus River Bridge on I-95 in Greenwich. Three people were killed and three others injured. For almost five months, 80,000 daily vehicles had to detour through city streets. March 2004: An oil tanker crashes on I-95 in Bridgeport and the ensuing fire is hot enough to melt steel supports on the Howard Avenue overpass. Traffic was disrupted for a week. September 2013: Con-Ed plans to replace a crucial electric feeder cable for Metro-North in the Bronx. The railroad decides to forgo the $1 million cost of a temporary back-up cable and the main cable fails, disrupting train service for weeks, both on Metro-North and Amtrak. June 2014: Twice in one week the Walk Bridge in South Norwalk (built in 1896) won’t close, cutting all rail service between New York and Boston. Cost of replacement will be more than $450 million. May 2016: Illegally stored chemicals and propane tanks at a gardening center under the Park Ave. viaduct catch fire. The flames’ heat melts steel girders, cutting all train service out of Grand Central Terminal and stranding thousands. Limited train service in the following days leads to subway-like crowding and lengthy delays. Mind you, this list does not include fatal accidents and disruptions caused by human error, like the Metro-North crash at Spuyten Duyvil that killed four. Our lives, our jobs and our economy rely on safe, dependable transportation. But when the roads we drive and the rails we ride are museum pieces or go uninspected and unrepaired, we are dangling by a thread. A single fire, whether caused by accident or act of terrorism, can bring down our infrastructure in an instant, cutting us off from work for days and costing our economy billions. What can be done? Safety inspections by engineers and fire departments looking to prevent disaster are obvious. Better enforcement of speed limits and safety are as well. But prevention of accidents cannot make up for decades of neglect in reinvestment in our roads, rails and bridges. The American Society of Civil Engineers’ annual infrastructure report card gives the US a D+. They estimate we will need to spend $3.6 trillion to get things back into good shape … less than the cost of the last 15 years of US fighting in the Middle East and Afghanistan. As the old auto-repair ad used to say, “You can pay me now or you can pay me later”. But sooner or later, we will have to pay. I hope you’ve been following CT-N to watch our dysfunctional legislature in recent weeks as they struggle to fill a $900 million budget gap. Not only could they not get a new budget together before adjourning (only to be summoned back mid-May for a special session), but the legislative logjam left several important measures in limbo. Among them, the long debated “lock box” for special transportation funding. As I wrote weeks ago, none of Governor Malloy’s plans to spend $100 billion to rebuild and expand our transportation systems over the next 30 years can go anywhere without an agreement to safeguard those funds from misappropriation by putting them in an untouchable “lock box”. Because the legislature couldn’t pass such a bill or even put it on the ballot as a potential constitutional amendment referendum, that puts the entire Malloy plan on hold. Without a lock box, nobody trusts Hartford with money raised by tolling or taxes, nor should they. The lock box idea is not new. In fact, it was Republicans who suggested it years ago. But when Malloy appropriated the idea as his own, GOP lawmakers saw the Governor’s version as more sieve than safe, and they held up a vote. Folks, if lawmakers can’t agree on an annual budget, let alone a way to keep transportation funding secure, how can we trust them with $100 billion in new money? The Connecticut Department of Transportation’s (CDOT) track-record on private-public partnerships for transit-oriented development also gives one pause. For example, consider the Fairfield Metro train station where a private developer went belly-up, leaving CDOT to finish the job, sort of: the beautiful new station they built still has no waiting room. Or consider the ongoing saga of the Stamford rail station garage. It’s been almost three years since CDOT tapped a private developer to demolish the old garage, replace it with a high-rise office / condo / hotel and build new commuter parking lots within a quarter mile from the station. In three years, nothing has been done because there is still no signed contract. Yet, that project is wrapped in such secrecy that nobody understands the delay. Or why the CDOT is even still negotiating with this laggard “developer of choice.” It couldn’t be because the developer contributed $165,000 to the Malloy campaign that he’s being given so much time, could it? Nah, that would never happen. So here we are, fellow Nutmeggers. Lawmakers deadlocked. A $900 million budget deficit to fill this year and another $2 billion hole in years ahead. State workers are being laid-off. State funding to towns for education is being cut (meaning local taxes rise). Billionaires are bailing (a third of our taxes are paid by the top 1 percent). And no prospects for a lock box … let alone more funding for transportation. Yup, just the same old stuff as ever. A few weeks ago a friend was showing me his new Chevy Volt. Not only does the hybrid-electric car get 42 mpg, it has its own Wi-Fi hotspot. That’s right. The car is a Wi-Fi device, so kids in the backseat can watch YouTube. Days later we were on a road-trip from the Maryland shore when we caught the Lewes – Cape May ferry. Onboard the vessel they offered passengers free Wi-Fi. Airlines have offered flyers Wi-Fi for years now. Discount bus lines like Megabus have free Wi-Fi. Even Connecticut’s new CTfastrak commuter bus system to Hartford gives its passengers free Wi-Fi. But there is no Wi-Fi on Metro-North. And the railroad says none is planned, even though the new M8 railcars are ready for the needed gear. And therein lies a story. When Amtrak first offered Wi-Fi on its Acela trains between Washington and Boston, they immediately had bandwidth issues. So many passengers were using their cell phones and tablets, speeds dropped to 0.6 mb per second and the complaints came pouring in. That’s part of the reason that Metro-North is reluctant to offer Wi-Fi: if an Acela train carrying 300 passengers can’t handle the online load, how could a 10-car train carrying a thousand commuters? The railroad has enough complaints as it is. 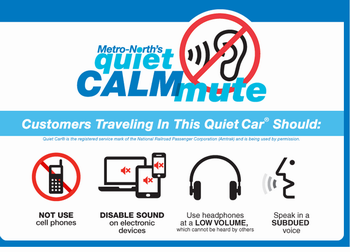 Metro-North’s experience with on-board communications has left them feeling burned. Remember years ago when the railroad installed pay-phones on the trains? Great idea, until a year later when costs came down and everyone had their own cell phone. Those pay cell phone booths went unused and were eventually removed. Back in 2006 then-President of MNRR Peter Cannito said Wi-Fi would be built into the new M8 cars, both for passengers and to allow the railcars to “talk” to HQ by beaming diagnostic reports. The railroad issued an RFP for ideas and got a number of responses, including from Cablevision, with whom they negotiated for many months. 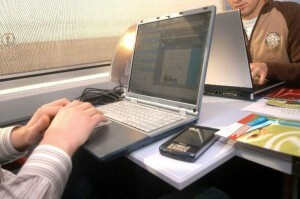 They even initiated on-train testing of Wi-Fi gear on one railcar. But Metro-North insisted any Wi-Fi would have to cost it nothing, that all the expense and tech risk would be borne by Cablevision or its customers. And that’s where the negotiations deadlocked. Today the railroad sees Wi-Fi as just a convenience. Smart phones and cell-card configured laptops can access the internet just fine, they say, using cellular technology. But to their credit the railroad is trying to get cell providers to fill in the coverage gaps, for example, in the tunnels and at GCT. So don’t look for Wi-Fi anytime soon on America’s biggest and busiest commuter railroad. It’s not seen as a necessity … except perhaps by its passengers who really have no other transportation option. Talking Transportation: Is Uber Really a Bargain? In the almost two years since Uber rolled into Connecticut, the state’s car/taxi service business has been rocked to its core. But is Uber competing on the same level as taxis and car service companies? Of course not, which is why it’s so successful. While Uber does offer a “black car” (premium) service, my comparisons are with their more popular Uber X service … private cars driven by non-chauffeurs, 7,000 of whom have signed up as drivers in CT, according to Powers. VEHICLES: Car services opt for Lincoln Town Cars and SUV’s. Uber X just requires drivers have a 4-door car, less than 10 years old with a trunk big enough to carry a wheelchair. MAINTENANCE: Klein owns and maintains his own fleet, inspecting all cars weekly. Uber relies on its X drivers to do upkeep. DRIVER SCREENING: Klein does his own background checks on top of the DMV screening required for a CDL (commercial drivers license). Uber says it does “rigorous” screening of drivers, including terrorist watch lists, but requires only a regular driver’s license. Klein’s firm also does random drug testing of his drivers. INSURANCE: Klein has coverage of up to $1.5 million for every driver. Uber relies on the individual driver’s personal insurance but layers a $1 million policy on top when they are driving Uber customers. RATINGS: Uber asks drivers and passengers to rate each other after every trip. Klein asks passengers to rate drivers but says it’s unfair to allow drivers to rate customers. “We’re in a service business,” he says. BOOKING: Klein says most of his reservations are made two to three weeks in advance. Uber doesn’t do advance bookings, though, in personal experience, I’ve never had to wait more than 10 minutes for a car. FARES: Though not an apples-to-apples comparison, an average car service ride from Darien to LaGuardia Airport is anywhere from $130 – $180, one-way. Uber’s quote for an X car is about $75. SURGE PRICING: When demand is highest, Uber adds a surcharge to fare quotes, sometimes doubling the fare. Klein says his rates are the same 24 x 7. IF YOU HAVE PROBLEMS: Klein says his office can be reached anytime by phone, toll-free. Uber’s website offers a template to file complaints online. So, is Uber really a bargain? Let me answer with a hotel analogy. Sometimes I love staying at the Ritz Carlton with its plush rooms and fabulous service. Other times, a Motel 6 or LaQuinta is fine, though there’s always the risk of a “surprise”. I see car services the same way. With a plush Lincoln SUV and chauffeur you get what you pay for. But sometimes all you want is to get from home to the airport and an Uber X is just fine … and a lot cheaper! An Amtrak dining car, from the Amtrak blog. A recent business trip took me to Dallas on a crowded, turbulent 3 ½ hour flight from LaGuardia. But the return trip was a real treat: two days and nights on Amtrak, for free. Riding a lot of Acela trains in the Northeast Corridor, I’ve built up a ton of Amtrak Guest Rewards points, augmented by their co-branded credit card. So when I checked my calendar and the Amtrak website, I saw an opportunity to enjoy a leisurely ride home in a full bedroom, meals included, gratis. The long distance trains I rode from Dallas to Chicago (The Texas Eagle) and Chicago to Washington, D.C. (The Capitol Ltd) were all “Superliners”, i.e., double-deck cars with a variety of accommodations, including coaches and sleeping cars. Each train also had a diner and an observation car, though the sightseeing through Texas, Arkansas, Missouri and Illinois wasn’t exactly memorable. But the second leg of the trip through the hills and river valleys of Pennsylvania and Maryland was gorgeous. “Fly over” country sure looks different from an elevation of about 20 feet. My bedroom was equipped with a big couch that folded down into an almost queen-sized bed, surprisingly comfortable for sleeping. The private commode doubled as a shower. Firing up my radio scanner, pre-set to the railroads’ frequencies, I followed the action as the conductor and engineer received instructions from a dispatcher hundreds of miles away. The food was good, all cooked to order, and included in my first class fare. Dining was communal, one of the fun parts of train travel: getting to meet real folks from across the U.S., chatting about their travels, their work – everything except politics. In Chicago and Washington D.C., where I had time between train connections, I enjoyed Amtrak’s “Metropolitan Lounge” for first class passengers, complete with free Wifi, snacks and priority boarding. I also had time to explore those cities’ beautifully restored train stations jammed with commuters, Amtrak passengers, shops and restaurants. To their credit, Amtrak does a great job with their money-losing long distance trains. The service is truly First Class, the ride smooth and, for the most part, on time (thanks to a heavily padded timetable). We had only two small delays… one caused by another Amtrak train colliding with a truck at a grade crossing (no injuries), the other by a boulder on the tracks that needed to be removed. Because demand is high and the supply of sleepers is low, fares for long distance Amtrak trains are pricey and booked many weeks in advance. Roundtrip airfare from New York to Dallas is as low as $230. But one-way on Amtrak is $299 in coach and $700+ in a roomette. Of course with Amtrak it’s like getting two nights of hotel plus meals, but to me it’s well worth it. So next time you’re planning a long distance trip, turn it into a journey. Take the train! You can’t take the train if you can’t get to the station, so invest in your commuting future by getting your name on your town’s (and neighboring towns’) waiting lists for annual parking permits. In four or five years, when your name rises to the top of the list, you’ll thank yourself. Meantime, opt for legal day-parking, find a friend to ride to the station with or try biking. There are free bike racks at most stations. There’s a science to deciding where on the platform to wait for your train. Many commuters position themselves at the front or rear of the train for a quick get-away when they arrive in Grand Central. Contrarian that I am, I tend toward the center of the train because that’s where there’s a better chance of getting a seat. Believe me, your commute will be a lot better seated than standing. Seats are in short supply, so here’s the strategy. As your train pulls in, scan the cars that pass you and see how the passenger load looks. As the doors open, move quickly inside, eye-ball your target seat and get there fast. Put your carry-ons in the overhead rack and sit down. If you hesitate, you’re toast and will be a standee. On trains leaving Grand Central, you may be able to get onboard up to 20 minutes before departure. Take a window or aisle seat on the three seat side. The middle seat next to you will be the last to be filled. If you didn’t get a seat on boarding, don’t give up. A few people on most trains get off in Stamford, so look for them and position yourself to get their seat before it gets cold. Here’s the secret: intermediate passengers have seat checks with a tear down the middle or a torn corner. Look for them and just before Stamford, position yourself near their row and, bingo, you’ve got a seat! Do not make the mistake of boarding a train without a ticket, or you’ll get hit with up to $6.50 penalty for buying a ticket on the train with cash. But if you’re thrifty, don’t buy a ticket from a ticket window or ticket machine. No, the cheapest tickets are only available online at www.mta.info. Go for the ten-trip tickets for an additional discount. Train time is not “your own time,” but shared time. So be considerate of your fellow commuters. Don’t hog empty seats, use the overhead racks. Keep your feet off the seats. If you must use your cellphone, go to the vestibule. Be like the Boy Scouts: anything you carry onto the train (including newspapers, coffee cups, etc.) carry off the train and dispose of properly. Driving to Hartford the other day (no, you cannot really get there by train) I saw a beautiful sight: hundreds of trucks! Yet, motorists hate trucks and mistakenly blame them for traffic congestion and accidents that cause hours of delays. Readers of this column know I’m a “rail guy” and would love to see freight trains replace trucks, but that ain’t gonna happen anytime soon. But as motorists we should not blame truckers for traffic woes of our own creation. Check the facts and you’ll find most highway accidents are caused by motor cars, not the trucks. Do trucks drive too fast? Sure, but don’t we all? Next time you’re on I-95, check who’s in the high-speed left lane and you’ll see cars, not trucks. Should there be better safety inspections of trucks? Absolutely! But for every over-weight truck or over-worked truck driver, there are doubtless hundreds of unsafe cars and equally road-weary warriors behind the wheel whose reckless disregard endangers us all. Truckers drive for a living. They are tested and licensed to far more rigorous standards than anyone else. And because they drive hundreds of miles each day, overall I think they are far better drivers. When’s the last time you saw a trucker juggling a cellphone and a latte like some soccer moms? And remember … they’re not out there driving their big-rigs up and down the highway just to annoy us. We put those trucks on the road by our voracious consumption patterns. Every product we buy at stores large and small, including the very newspaper or iPad you hold in your hand, was delivered by trucks. Want fewer trucks on the road? Just stop buying stuff. By definition, trucks are high-occupancy vehicles. Compare the energy efficiency of a loaded truck delivering its cargo to you in your “SOV” (single occupancy vehicle), even if it is a hybrid. Only rail offers better fuel efficiency. Why are trucks jamming our highways at rush hour? Because merchants require them to drive at those times to meet the stores’ delivery timetable. If big-box stores and supermarkets only took truck deliveries in the overnight hours, our highways would flow much better at rush hour. Truckers must use the interstates while passenger cars can chose among many alternate routes. Why is the average distance driven on I-95 in Connecticut just 11 miles? Because most of us drive the ‘pike for local, not interstate trips. If we were smart enough to “value price” our highways (i.e., return tolling), we’d see fewer vehicles of all kinds on I-95, and those that were willing to pay for the privilege of motoring there would get real value in a faster ride. I’m hardly an apologist for the trucking lobby. But neither is it fair for us to blame anyone but ourselves for highway safety and congestion. It’s the SOV crowd, not the truckers, who are to blame. Let’s be honest about this mess of our own making and stop trying to blame truckers as our scapegoat. As the great philosopher Pogo once put it, “We have met the enemy and he is us! Of course, when the highway is not jammed, speeds are more like 70 mph with the legal limit, unfortunately, rarely being enforced. 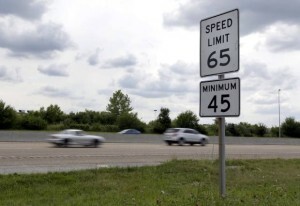 Which got me thinking: who sets speed limits on our highways and by what criteria? Why is the speed limit on I-95 in Fairfield County only 55 mph but 65 mph east of New Haven? And why is the speed limit on I-84 just 55 mph from the New York border to Hartford, but 65 mph farther east in “the Quiet Corner”? Why does the eastern half of the state get a break? Blame the Office of the State Traffic Administration (OSTA) in the CDOT. This body regulates everything from speed limits to traffic signals, working with local traffic authorities (usually local Police Departments, mayors or Boards of Selectmen). OSTA is also responsible for traffic rules for trucks (usually lower speed limits) including the ban on their use of the left hand lane on I-95 in most places. It was the Federal government (Congress) that dropped the Interstate speed limit to 55 mph in 1973 during the oil crisis, only to raise it to 65 mph in 1987 and repeal the ban altogether in 1995 (followed by a 21% increase in fatal crashes), leaving it to each state to decide what’s best. In Arizona and Texas that means 75 mph while in Utah some roads support 80 mph. Trust me … having recently driven 1000+ miles in remote stretches of Utah, things happen very fast when you’re doing 80 – 85 mph! About half of Germany’s famed Autobahns have speed limits of 100 km/hr (62 mph), but outside of the cities the top speed is discretionary. A minimum of 130 km/hr (81 mph) is generally the rule, but top speed can often be 200 km/hr (120 mph). Mind you, the Autobahn is a superbly maintained road system without the bone-rattling potholes and divots we enjoy on our highways. And the German-built Mercedes and Audis on these roads are certainly engineered for such speed. American cars are designed for maximum fuel efficiency in the 55 – 60 mph range. Speed up to 65 mph and your engine runs 8 percent less efficiently. At 70 mph, the loss is 17 percent. That adds up to more money spent on gasoline and more environmental pollution, all to save a few minutes of driving time. But even bigger than the loss of fuel efficiency is aerodynamic drag, which can eat up to 40 percent of total fuel consumption. Lugging bulky roof-top cargo boxes worsens fuel economy by 25 percent at interstate speeds. So does carrying junk in your trunk (or passengers! ): a 1 percent penalty for every 100 pounds. Even with cheaper gasoline, it all adds up! Everybody writes “Year in Review” stories. But rather than dwell on the past, I’ve got the guts to predict the future! Here’s what will happen in 2016 in the transportation world. METRO-NORTH: Slowly but surely, the railroad will drag itself out of the quagmire it’s been in since the Bridgeport, Spuyten Duyvil and Valhalla crashes. On time performance will hold strong even through the winter, thanks to the dependable new M8 cars and mild weather. Ridership will continue to climb, causing further crowding and standing room only conditions on some trains. STAMFORD GARAGE: After waiting for its chosen developer (and Malloy campaign contributor) JHN Group to sign a contract two and a half years after being tapped for the massive transit oriented development project, Connecticut Department of Transport will plug the plug on its deal and replace the old garage on its own (taxpayers’) dime. TOLLS & TAXES: Governor Malloy’s quest for $100 billion to pay for his 20-year transportation plan will prove universally unpopular when his Transportation Funding Task Force finally issues its recommendations (originally due after Labor Day) in January. The panel will call for higher gasoline and sales taxes, tolls, motor vehicle fees and a slew of other unpopular ideas. The legislature will react by slashing the Governor’s unrealistic plans, reluctant to have its fingerprints on anything the Task Force suggests. EMINENT DOMAIN: Governor Malloy will try again to impose state control over transit oriented development, reintroducing his stealth bill to create a Transit Corridor Development Agency (all of whose members he would appoint) with the power to seize any land within a quarter mile of a rail station. FLYING: Returning to profitability, airlines will continue to squeeze more seats onto fewer flights, making flying an ordeal. Frequent flyer rewards will be harder to get as desperate passengers will pay to ride in business or first class, leaving fewer seats for upgrades. AMTRAK: Acela will become increasingly popular, allowing the railroad to raise business fares. Last minute seats will be harder to get, but the railroad will still refuse to expand service by buying new railcars. Traditional “Northeast Corridor” trains will still be jammed as the railroad tries to compete with discount bus carriers. HIGHWAYS: With an improving economy and inadequate rail station parking, people will jam I-95 and the Merritt Parkway in even larger numbers, increasing commuting times further. Gasoline prices will continue to decline thanks to cheap oil, sending even more people to the roads. UBER WAFFLES: State and city authorities will come down hard on car services like Uber and Lyft, imposing on them the same regulations and taxes now born by taxis and limos. After “leveling the playing ground”, Uber-type services will raise fares, passing those costs on to passengers. Will all of my predictions come true? Check back in a year and we’ll see … meantime, happy traveling in 2016! TRANSITCHEK: See if your employer subscribes to this great service, which allows workers to buy up to $130 per month in transit using pre-tax dollars. If you’re in the upper tax brackets, that’s a huge savings on commutation. A recent survey shows that 45 percent of all New York City companies offer TransitChek, which can be used on trains, subways and even ferries. GO OFF-PEAK: If you can arrive at Grand Central weekdays after 10 a.m. and can avoid the 4 to 8 p.m. peak return hours, you can save 25 percent. Off-peak’s also in effect on weekends and holidays. These tickets are good for 60 days after purchase. BUY TICKETS IN ADVANCE: If you buy your ticket on the train you’ll pay the conductor a $5.75 – $6.50 “service charge”… a mistake you’ll make only once ! (Seniors: don’t worry, you’re exempt and can buy on-board anytime without penalty.) There are ticket machines at most stations, but the cheapest tickets are those bought online. And go for the ten-trip tickets (Peak or Off-Peak) to save an additional 15 percent. They can be shared among passengers and are good for six months. KIDS, FAMILY & SENIOR FARES: Buy tickets for your kids (ages 5 – 11) in advance and save 50 percent over adult fares. Or pay $1 per kid on board (up to four kids traveling with an adult, but not in morning peak hours). Seniors, the disabled and those on Medicare get 50 percent off the one-way peak fare. But you must have proper ID and you can’t go in the morning rush hours. FREE STATION PARKING: Even stations that require weekday parking permits usually offer free parking after 5 pm, on nights and weekends. Check with your local town. METROCARDS: Forget about the old subway tokens. These nifty cards can be bought at most stations (even combined with your Metro-North ticket) and offer some good deals: put $5.50 on a card (bought with cash, credit or debit card) and you get a 5% bonus. Swipe your card to ride the subway and you’ll get a free transfer to a connecting bus, or vice versa. You can buy unlimited ride MetroCards for a week ($31) or a month ($116.50). BUT IS IT CHEAPER TO DRIVE? : Despite being a mass transit advocate, I’m the first to admit that there may be times when it’s truly cheaper to drive to Manhattan than to take the train, especially with three or more passengers. You can avoid bridge tolls by taking the Major Deegan to the Willis / Third Ave. bridge, but I can’t help you with the traffic you’ll have to endure. Check out www.bestparking.com to find a great list of parking lots and their rates close to your destination. Or drive to Shea Stadium and take the # 7 subway from there. The bottom line is that it isn’t cheap going into “the city”. But with a little planning and some insider tips, you can still save money. Happy Holidays! Will the train of the future be a high-speed tube, not a railroad? That’s inventor and entrepreneur Elon Musk’s and others’ vision. And Musk, the man who brought us the Tesla (all-electric car) and SpaceX (for-profit space rocket company) is putting his own money behind a proof-of-concept project for what he calls Hyperloop. The concept sound simple: move passengers in a sealed tube through a series of giant pipes propelled by air pressure at speeds up to 700+ mph. That would mean a trip from New York to DC would take 20 minutes. Alfred Beach’s “Pneumatic Transit” system. But this is not a new concept. In fact, the first experimental “subway” in New York City, Alfred Beach’s “Pneumatic Transit” proved back in 1870 that it would work. Despite political opposition, Beach secretly built a 300-foot-long subway under Broadway near City Hall, offering daring passengers a round-trip ride in the system’s only railcar, pushed and pulled by air. The system ran for almost three years and carried over 400,000 riders, 11,000 alone in the first two weeks. The fare was 25 cents (equivalent to $18 today). Competing elevated railroad owners eventually won the City’s franchise and Beach’s system was abandoned. Even Beach’s idea wasn’t new, as vast underground pneumatic tube systems in Paris and London were already delivering telegrams and mail by the 1850’s. As recently as the 1960s, office buildings in major cities were designed with pneumatic tube systems for inter-office mail. Some older department stores still use the tubes to record sales and make change from a centralized money room. Hurtling through a tube may be fine for mail, but what about humans? As a recent article in Smithsonian Magazine points out, the psychological factor of being enclosed in a sealed tube, traveling 700+ mph, is not that much different than flying in a jet … maybe just a bit more claustrophobic. Whether by train or plane, I always like to look out the window. Seeing where we’re going is half the fun, even on a familiar route. But wrapped in a metal tube inside a giant pipe affords no views at all. Riding 31 miles in the Chunnel under the English Channel takes 20 minutes at today’s speeds, and that’s more than enough time for me, thank you very much. Of greater concern are the propulsion methods and the sheer physics of accelerating and braking from near-supersonic speeds. But the biggest challenge of all would be where to locate the “pipes” and how to acquire necessary land. A station inside the “Pneumatic Transit” system. Like high-speed rail, it would make no sense to follow the median on Interstate 95 or the Metro-North / Amtrak rights of way with all their twists and turns. And anyone crazy enough to invest in any project along the coastline with the inevitability of rising sea levels should probably think pontoons, not pipes. It will be interesting to see if Musk’s and others’ Hyperloop concepts get off the ground (pun intended) … but I don’t expect to ride such a system any distance in my lifetime.